E3 TEKKEN 6 Tournament! | SDTEKKEN.COM - TEKKEN News Resource! 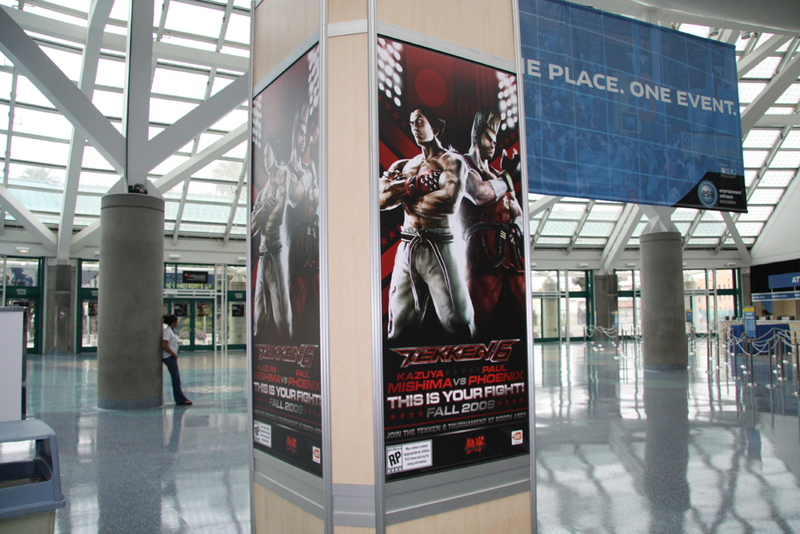 Namco Bandai Games Inc. will play host to a grand TEKKEN 6 tournament during E3! Sign-ups and tournament starts June 2nd! Another tournament is scheduled for the following day. Click below for the full press release! Company to feature demos from explosive fall line up and host TEKKEN 6: Bloodline Rebellion arcade tournament. May 28, 2009 – SANTA CLARA, Calif. – Leading video game publisher and developer NAMCO BANDAI Games America Inc. today announced highlights of its plans for the Electronic Entertainment Expo (E3) at the Los Angeles Convention Center, June 2-4, 2009. At its booth, E3 attendees will be able to enter a two-day TEKKEN 6: Bloodline Rebellion tournament and preview nearly a dozen titles from a variety of consoles including – the Xbox 360 video game and entertainment system from Microsoft, the PLAYSTATION 3 computer entertainment system, the PSP (PlayStation Portable) system, and Wii. NAMCO BANDAI Games’ diverse lineup offers exciting new iterations of top-tier franchises, licensed brands and new properties encompassing multiple genres for players of every age and skill level. NAMCO BANDAI Games will be located at South Hall, Booth 801. The main event for show-goers will be hands-on gameplay time with the company’s exciting new titles releasing later this year. Attendees will have a chance to enter the latest King of Iron Fist Tournament with TEKKEN 6 and play an exciting new game mode for Xbox 360 and the PLAYSTATION 3 system, experience the brutal world of Grant City as both a vice cop and his canine companion in Dead to Rights: Retribution on Xbox 360 and PLAYSTATION 3, find the most robust and feature-packed portable fighting game with SOULCALIBUR: Broken Destiny on the PSP System, get an extreme workout with Active Life: Extreme Challenge for Wii and much more. With games covering all genres and platforms, there’s something for everyone at the NAMCO BANDAI Games booth. As an added draw for E3 attendees, NAMCO BANDAI Games will host a two-day TEKKEN 6: Bloodline Rebellion arcade tournament at its booth on Wednesday, June 3 and Thursday, June 4. Sign-ups will begin Tuesday, June 2, at the booth, with competitions running at 2 p.m. and 4 p.m. on June 3 and June 4. The winner of the 2 p.m. tournament will be invited to compete against the winner of the 4 p.m. tournament for a grand prize on each of these days. NAMCO BANDAI Games America Inc. is a leading interactive entertainment software publisher and developer based in Santa Clara, CA. The company is a part of the NAMCO BANDAI group of companies known for creating and publishing many of the industry’s top video game franchises including the PAC-MAN, SOULCALIBUR, and Tekken brands. For more information about NAMCO BANDAI Games America Inc., and our products log onto namcobandaigames.com. This entry was posted on Monday, June 1st, 2009 at 9:59 AM and is filed under Arcade, E3 2009, Namco Bandai Games Inc., TEKKEN 6, TEKKEN 6: Bloodline Rebellion, Tournament, USA, Video Games. You can follow any responses to this entry through the RSS 2.0 feed. You can leave a response, or trackback from your own site. 27 Responses to E3 TEKKEN 6 Tournament! Is there info about their T6 tournament rules? Usual double elimination or NB prefer something another? Is THIS the big update? I think you mean Fall 09. It’s only 5 more months away. Go practice juggle spamming in T5DR to pass the time, like me. I would just like at least a release month to be announced at E3. DAMN IT DAMN IT DAMN IT DAMN IT!!! F@[K!!! hold up is this arcade or ps3/360? MarkMan, the news aren’t exactly mind-blowing, tbh. Was it meant to be mind blowing? I’m just trying to share info. lol. tbh, I think I know it’s not mind blowing, but thanks for telling me. Why would they release a demo so early? It’s not even summer yet. LULZ SO WHAT IF THEY RELESE THE DEMO ARE U AGINST IT??? No. With No official release date why would you think they would release a demo this early. And if it’s anything like SC4 it wouldn’t be released until after the retail version is out. I mean it’s common sense. Man I can’t wait for the new PSP Go, my PlayStation Portable 1st gen really needs a replacer. SF is the most good series to ever happen to fighting arcade gamesno doubt, without it I know the genre might disappear…Not that I dont like other games, I just think SF is most loved the community the most.